Synopsis: The Best Exotic Marigold Hotel (also known as The Best Exotic Marigold Hotel for the Elderly and Beautiful) is a 2012 British film directed by John Madden and written by Ol Parker. Based on the 2004 novel, These Foolish Things, by Deborah Morgacch. 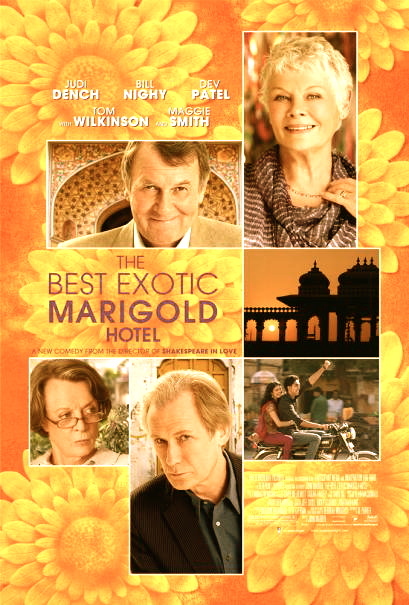 The ensemble cast includes Britain’s elite and arguably their best character actors, Dame Judi Dench, Celia Imrie, Bill Nighy, Ronald Pickup, Dame Maggie Smith, Tom Wilkinson and Penelope Wilton, as a group of British retirees “outsourcing” their retirementin the Marigold Hotel for the Elderly and Beautiful, in India. Dev Patel (Slumdog Millionaire) rounds out the cast as Sonny the young owner of the hotel. Review: This is film less about the destination and more about the journey and catharsis of a group of seven retired British nationals whose life circumstances have brought them to Exotic Marigold Hotel for the Elderly and Beautiful in a small city in India. Each with their own tale of woe and search for a greater future in their twilight years. The movie begins with an prologue that describes each character’s present situation and what leads them to the hotel. Dame Judi Dench plays Evelyn a recently widowed housewife who is forced by her family to sell her flat to pay off her dead husband’s debts. Despite their son’s protestations, she decides to make her home in India, in Sonny’s home for the “elderly and beautiful”. She keeps a blog to inform her family of all that she does and all whom she encounters. It is through the blog that on a daily basis the story unfolds.She is marvelous in the role and plays it with class, determination and wit. Tom Wilkinson (Benjamin Franklin in HBO’s John Adams Series) plays Graham, he is an British high court judge who for the past few years keeps saying he will retire any day now., finally at a retirement party for a colleague he decides today is the day. He goes to India where he gre up for the first 18 years of his life only to go back 40 years later to reconcile his past. Dame Maggie Smith portrays Muriel an ex-housekeeper with a head for figures, is deemed surplus to requirements by her lifelong employers after she unwittingly trains her own replacement. She finds herself without a family of her own, having devoted her life to the care of another family. Living in a flat alone she is bitter and racist, and, when her doctor tells her that the only alternative to a six-month wait for a hip replacement is to be “outsourced” to India where the operation can be scheduled without delay, she is sent to Sonny’s hotel. Bill Nighy plays Douglas the Husband of Patricia Wilson’s Jean. This is a married couple who gave all their savings to their daughter who has stated a new internet based company. Needless to say this has made the hotel the only place they can afford to retire to. Douglas is up for the adventure and his wife is desperately unhappy from day one. The strain on their marriage is too much for Jean to take and the couples differences bring their marriage to the brink. Ronald Pickup plays Norman an aged Lothario, constantly on the look-out for a new woman and unable to face up to his own age and consequent undesirability for young women. He seeks a new start with new possibilities in India. Celia Imrie plays Madge, she has had several unsuccessful marriages and, like Norman, wants fun, adventure and a new man. Tired of her daughter’s attempts to keep her at home as the family babysitter she flees the house and leaves for India. The screenplay is witty and the humor is at times so true it touches you from the inside and at times moves you to tears. This is a fine film with a human soul that tugs at your heartstrings as it points out the irony of aging in a young world and coping with the sometimes bittersweet realities of life. This films caters to the much neglected demographic of aging baby-boomers and judging from the size of the audience I was in I would say that the future looks successful for this group of seven. This sounds like a wonderful film. I have a sneaky suspicion that I would love this. Judy Dench is a class act! She is brilliant in everything she does. Great, talented cast. I look forward to watching. Thanks Randy! Anytime Michelle. Fabulous acting with an all-star British cast, I think you’ll love it on many levels.